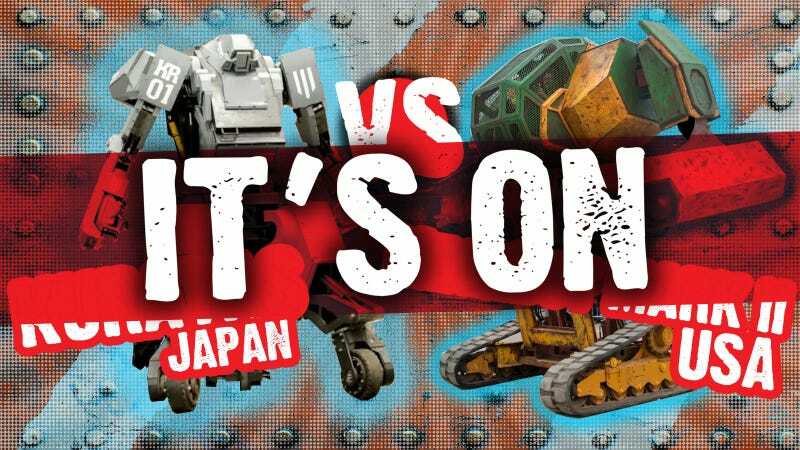 Last week, we reported about how MegaBots, the American giant-piloted-robot-concern, finished their brute of a mech, the MegaBot Mark II, and immediately challenged the one other existing giant fighting robot, Japan’s Kuratas, to a duel. Well, peoples of earth, get excited, because the Japanese accepted. It’s on. “Come on guys, make it cooler. Just building something huge and sticking guns on it — it’s super American. Do the kids still say ‘oh, snap?’ Because oh, snap. I agree with Kogoro Kurata here — a melee-type fight will be much more exciting to watch than two giant mechs belching projectiles at one another. Kurata kicks the ball back to MegaBots to get the location picked and the battle organized, because that’s the boring crap nobody wants to do. It still seems likely to happen in a year’s time, and as we get more information on when and where, we’ll let you know, and hopefully we’ll be covering this live or something like that. What a glorious world we live in.